This weekend’s rundown includes a new Schaefer Art Gallery exhibit and two dynamic concerts on Sunday. First, Transfer of Memory, a collection of photo portraits of Holocaust survivors, opens March 22 at the Schaefer Art Gallery. Sunday, the Gustavus Symphony Orchestra Concerto/Aria Concert for High School Musicians features Harrison Hwisung Oh, a high school senior and winner of the Concerto/Aria Competition for High School Musicians. Sunday night soprano Maria Jette will be performing a program of some of her favorite French songs. 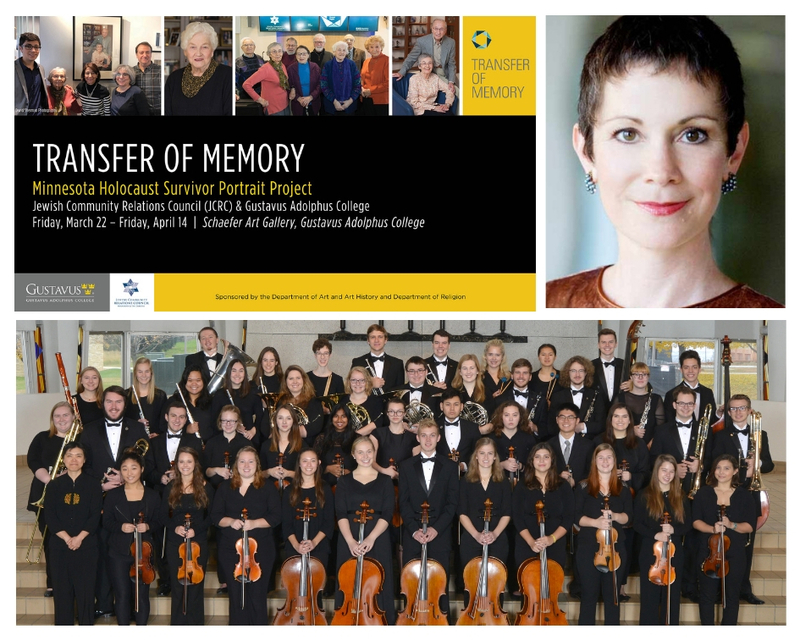 Open everyday from 8 a.m.–10 p.m.
A new exhibit at the Schaefer Art Gallery, Transfer of Memory, opens March 22. This exhibit features photo portraits of Holocaust survivors living in Minnesota, at home in full color. Accompanying the exhibit is two weeks of special programming, including children of Holocaust survivors telling their parents’ stories. This coming week features two of these events. More information about this exhibit and the programming surrounding it can be found here. The Gustavus Symphony Orchestra features Concerto/Aria Competition for High School Musicians winner Harrison Hwisung Oh. Oh, a senior at Pre-Conservatory Program Center of Excellence at Shattuck-St. Mary’s School, will perform Antonin Dvořák’s Cello Concerto in B Minor. The program also includes “Towards a New Life. op. 35c” by Josef Suk and Schubert’s “Unfinished” Symphony. This concert features a host of French pieces and composers performed by soprano Maria Jette. The repertoire varies greatly, from simple and bright to emotional and complex. Pieces include “Boléro” by composer Charles Gounod, “Chanson Triste” by Henri Duparc, and “Voyage à Paris (Banalités)” by Francis Poulenc. Please note this concert changed dates from its original date of Saturday, March 23 to Sunday, March 24 as noted above.